The Gunners prevailed with a 2-1 at the Emirates on an emotional night. A game that will ultimately be overshadowed due to the tragic events involving Emiliano Sala and pilot Dave Ibbotson, who was due to sign for Cardiff when the plane carrying the two went missing. Both sides paid touching tributes at the Emirates Stadium prior to kick off with both captains laying flowers on to the pitch before a minute of silence was observed. Sala was also listed under the squad’s names in the matchday programme with a daffodil placed next to his name, a flower with significance to both Wales and his former club FC Nantes. 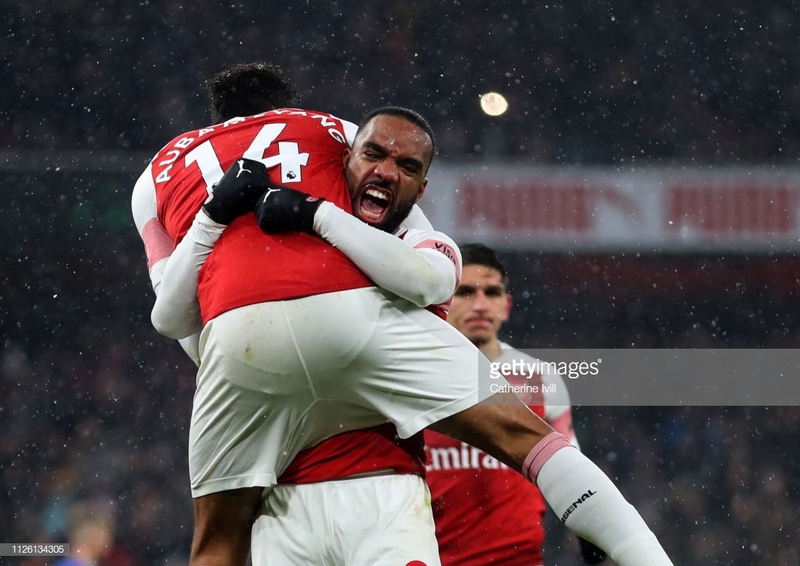 In what was a tough fought game, the Gunners prevailed with a 2-1 victory thanks to goals from Pierre-Emerick Aubameyang and Alexandre Lacazette who gave Arsenal a 2-0 cushion before Nathaniel Mendez-Laing pulled back a consolation goal for the visitors in stoppage time. Arsenal struggled to break down a rugged Cardiff back line in the opening 45 minutes as the Gunners attacking firepower failed to make any real impact. Despite this Lacazette would have felt aggrieved to have not been given a penalty by referee Mike Dean as the Frenchman attempted to stay on his feet but stumble under a clumsy challenge by Bruno Ecuele Manga. Lacazette’s frustration was escalated when on the stroke of half-time Manga again looked to have fouled the French striker in the box, leaving his studs on Lacazette’s calf but Dean again waved away Arsenal appeals. Lacazette was a constant nuisance for the Cardiff defence with his immense work rate proving to be a scourge of the visitors and his determination was finally rewarded when he notched his ninth Premier League goal of the season to double his sides lead with ten minutes to go. A superb solo effort effectively gift-wrapped the three points for Arsenal as Lacazette dashed away from Sol Bamba and drove into the box before firing a shot past Neil Etheridge. Having been on the fringes of the Arsenal squad for a number of months and often left out of the matchday squad altogether by Unai Emery for ‘tactical reasons’, Mesut Ozil returned to the Arsenal starting line-up for the first time since Boxing day. Up against a resilient Cardiff defence, Ozil undoubtedly has the talent to unpick the toughest of defences in the world, but the German had a frustrating night. Often having to come very deep to receive the ball, Ozil was often the man trying to generate the play for the Gunners and give them some rhythm rather than featuring in the final third where he can cause more problems for the opposition. There were flashes of brilliance from Ozil which they may have missed through his omission, as the German was able to play some clever one, twos and quick combination play with the players ahead of him. But he struggled to put his stamp on the game and in one particular incident showed his shortcomings which frustrate so many when he was shrugged off the ball near the Arsenal box by Junior Hoilett which almost cost his side a goal. If Ozil is to win himself back into the thoughts of the manager, he’ll need to produce more when given the chance. Pierre-Emerick Aubameyang is enjoying a fine season again for the Gunners having made an instant impact since arriving at the Emirates last January. Despite not enjoying his best game against Cardiff, Aubameyang held his nerve from the penalty spot as he waited for Etheridge to make the first move before calmly rolling the ball the other side of the keeper to break the deadlock. That meant that Aubameyang has become the fastest ever Arsenal player to reach 25 Premier League goals, doing so in just 37 games compared to Thierry Henry’s 42 and Ian Wright’s 51. He is also the 5th fastest to 25 Premier League in league history putting him amongst very esteemed company.